I mentioned last week that I had a lot of egg whites left over after making my king cakes. I wanted to make a cake since I was still in birthday mode, but after a fairly indulgent month eating chocolate cookies and cream cheese filled cakes, an angel food cake seemed like a nice alternative. A sweet treat without any of the guilt! But I didn’t want a plain angel food cake and I already made a chocolate one a few years ago so I decided to incorporate my current obsession: citrus! I just can’t get enough of oranges and lemons and grapefruits lately and a citrus cake sounded really refreshing. I always feel like grapefruit is kind of underrated compared to other citrus fruits, so I decided to make the grapefruity-est dessert I could come up with. 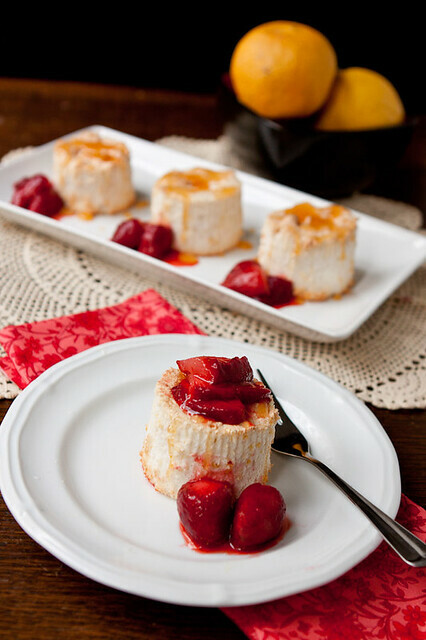 This grapefruit angel food cake is flavored with grapefruit juice and zest and then drizzled with a grapefruit syrup. I also mixed a little grapefruit juice and zest with strawberries to use as a garnish. Obviously, if grapefruit isn’t your thing you can substitute your favorite citrus but despite how much I love lemons and oranges, I absolutely adored how this cake turned out and wouldn’t want it any other way. The cake by itself is quite sweet and only has a subtle grapefruit flavor since you can’t really add too much liquid to an angel food cake recipe, but the concentrated syrup gives that nice tart pop of grapefruit flavor in every bite. The cakes don’t really need the strawberry garnish, but I’ve loved combining grapefruit and strawberries since the granita I made a few years ago so it seemed like a no brainer. Since I’m a fan of miniature desserts I made individual cakes in my jumbo muffin pan. I also tried a few in a normal sized cupcake pan which were fine but since the cake is so light and fluffy it was just a little too…insubstantial (and kind of shriveled-looking). The jumbo pan made perfect sized cakes: more than a few bites but not overly large. Still, it’s a good thing these cakes are fat free because you’ll want to eat more than one! You can make this into a full size cake by doubling the recipe. Separate eggs and discard yolks or refrigerate/freeze for another use. Measure the egg whites to make sure you have 3/4 cup, adding or removing whites if necessary. Place in a mixer bowl and let stand at room temperature for 30 minutes. Meanwhile, make the strawberry garnish (if using). 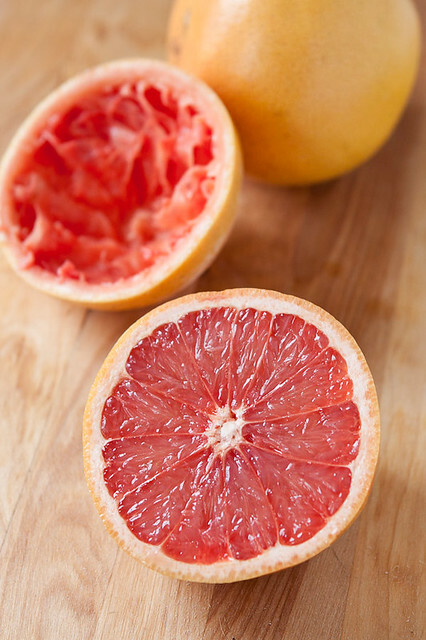 Add the sliced strawberries to a bowl along with the sugar, grapefruit juice and peel. Refrigerate at least one hour or overnight, stirring occasionally. Preheat oven to 350 degrees (F). Fill muffin pan with paper liners and lightly spray them with cooking spray. Sift powdered sugar and flour together three times. Stir in the grapefruit peel. Set aside. Add cream of tartar, grapefruit juice and salt to the egg whites. Beat on medium speed until frothy. Gradually add sugar and beat on high speed until sugar is dissolved and stiff peaks form. Gently fold in flour mixture, 1/4 cup at a time. Gently spoon batter into paper liners, filling about 3/4 full. Use a knife to cut through the batter to remove air pockets. Bake for about 15 minutes or until cake springs back when lightly touched. Transfer to a wire rack to cool completely. Meanwhile, stir together grapefruit juice and sugar in a small saucepan over medium heat. Bring to a boil, reduce heat slightly and simmer until the mixture has reduced by half, about 15 minutes. Set aside to cool. 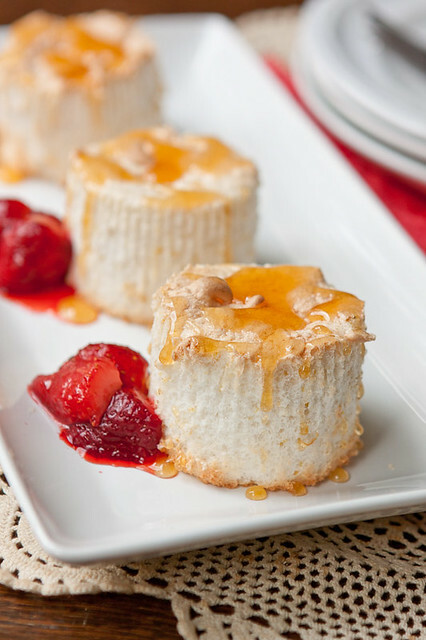 Serve the cakes drizzled with the grapefruit glaze and garnished with strawberries. Love this idea! 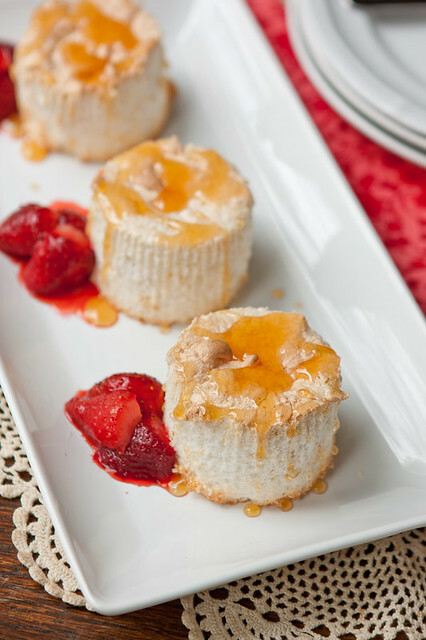 I’ve never tried making angel food cakes mini style. I like the way you think! I love all things citrus lately, too, so these look perfect to me. Making them individual is such a smart idea, too. They came out beautiful. Absolutely gorgeous, and what a fantastic combination of flavors! These are so cute! The perfect individual size! 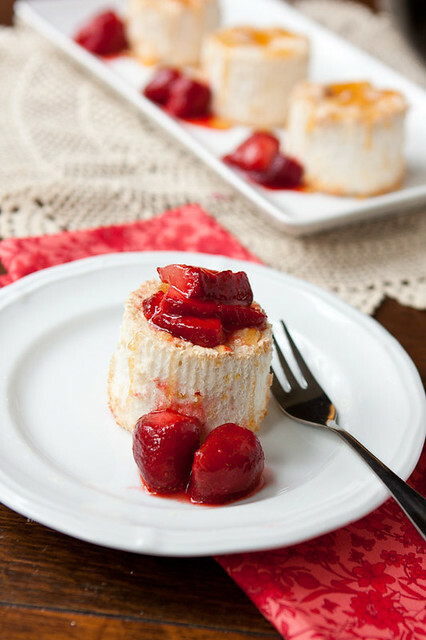 And such a great thing to do with leftover egg whites (of which I have some in my fridge right now…).